Preheat oven to 325 degrees-F. Combine flour, granulated sugar, baking powder, dry milk, and salt in a large mixing bowl. Melt butter and add to the bowl, stir to combine. Add two eggs, one at a time, and thoroughly incorporate. Line an 8-inch x 8-inch cake pan with parchment paper. Press mixture into the cake pan into one thick, even layer. Scatter berries across the batter and set aside. Beat together cream cheese and Confectioners’ sugar. Add remaining two eggs, one at a time, and thoroughly incorporate. Add vanilla extract and mix. 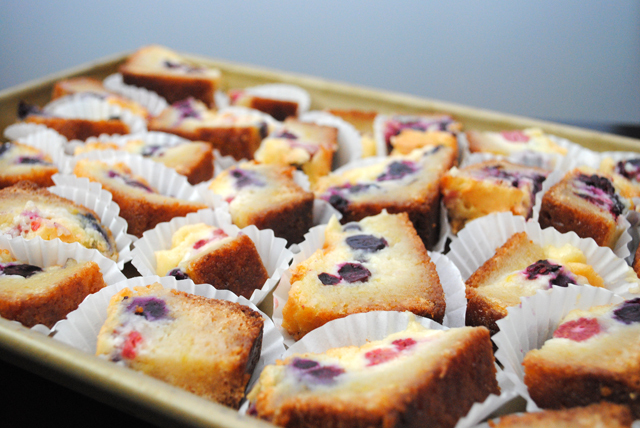 Pour cheese filling over the berries and cake batter. Use the back of a spoon to push the cheese mixture into the corners of the pan and be sure to cover all of the berries if possible. Bake for 40 minutes or until edges are slightly browned. The center will still be slightly jiggly when done. Let cool to room temperature in the pan. Cool in the refrigerator or freezer in the pan. The bars are easier to cut when cold. Remove from pan and slice. Transfer to serving plate or into muffin cup liners. Serve at room temperature, store in the refrigerator.